Equestrianism can be an expensive hobby. In fact, many people consider equestrianism to be the sort of activity that only the wealthy can afford to pursue. It is certainly true that there are some unavoidable costs associated with either horse riding or horse ownership. But that doesn’t have to mean that it is out of your reach. Instead, with a few simple tricks you can cut the cost while still enjoying equestrianism. Horse ownership is perhaps the most significant cost facing any equestrian enthusiast. Buying and keeping a horse are expensive. But there are a few ways that you might be able to keep the cost down. Many riders choose to enter into ‘shared ownership’ arrangements with others. This can be a great way to get use of a horse, without having to fork out for the entire cost. Generally, the costs are split equally between owners, and time with the horse is divided on a mutually agreed system. If you do choose this arrangement, make sure that you all understand exactly what is being agreed on. It might help to write down what you arrange in advance, in order to avoid misunderstandings. Your choice of yard is another potentially important factor. To begin with, you should make sure that you ‘shop around’ before deciding on a yard. You should also consider explaining your budget to the yard owners from the outset; many will be able to offer something suitable. It is also important to remember the different types of livery yard arrangements. Full livery, where basically everything is taken care of, is the most expensive option. You can keep your costs down by, for example, choosing a DIY livery arrangement. 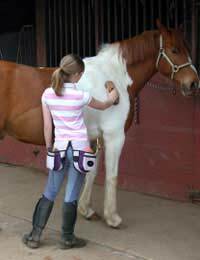 Alternatively, you might consider ‘working livery’, where your horse is used in lessons by the yard. This can significantly reduce your livery costs. New tack is hugely expensive. It is perfectly possible to spend many hundreds of pounds on a saddle, for example – but for most people this is simply impossible. You should consider looking for second-hand equipment instead. There is a huge range of high quality second-hand tack to be had, for example on online auction sites or at dedicated equestrian fairs. You may also find that your yard has a tack exchange system – or you may simply find some second-hand equipment just by asking around. Do remember, though, that items like saddles must be suitable for your horse. It can be tempting to go for a second-hand item simply because it is cheap, but you must make absolutely sure that it is the right fit. Poorly fitting or poorly made tack is bad for your horse, and can require vet callouts – which are, of course, expensive. Equestrianism can be a costly thing to take up. But many people are working to bring down the cost of horse ownership and use, in order to make sure that as many people as possible are in a financial position to enjoy the wonders of equestrianism.